Sometimes it’s easier to simply talk about a whole series. The Darker Shade of Magic trilogy flows smoothly from one book to the next and is hard to describe as separate entities. Granted I was forced to read them with long gaps in between because they’re my wife’s books and she didn’t read the second one until the third one came out, and then I had to wait a couple weeks after the second one before she finished the third. Torture, I know, but it’s rude to read someone else’s book before they do. In the months separating The Darker Shade of Magic from A Gathering of Shadows Lila has established herself on a ship of somewhat reputable individuals and has finally found the freedom she has dreamed of since her childhood, while Kell feels more imprisoned than ever. After the events of the Black Night, the king and queen have tightened their leash and it’s all Kell can do to keep from screaming. But as the Essen Tach, a magic competition between three allied nations approaches, Lila and Kell’s paths begin to converge once again. But other powers begin to loom in the shadows. The evil that was trapped in Black London begins to move and its corrupting influence seeks richer worlds: worlds where rivers run red with power. Beautiful and compelling. 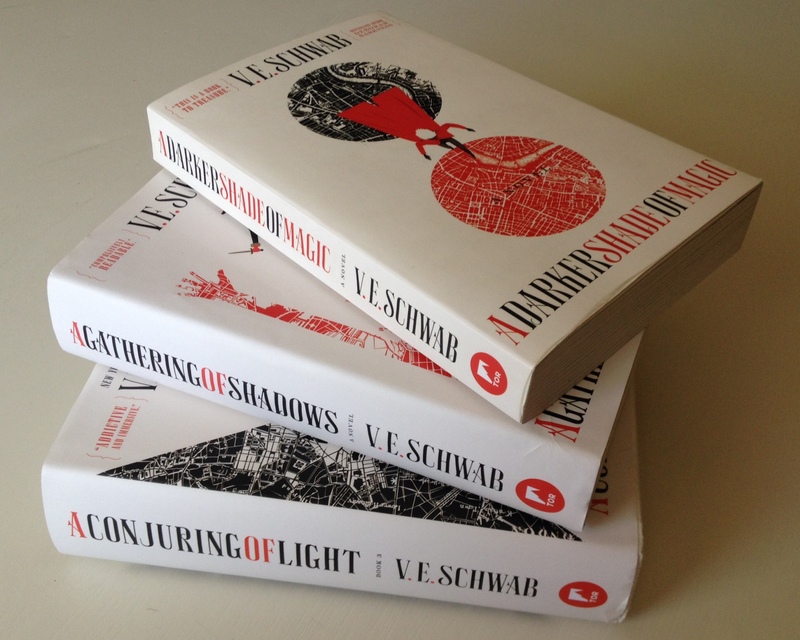 V. E. Schwab’s series will pull you to the edge of your seat and hold your interest from start to finish. If I wrote those back of the book blurbs that might be something I would write. The second book is a little slow and doesn’t really pick up until the final quarter of the book, but what trilogy doesn’t do that. The second book is the development book. The author has a lot of characters to introduce and develop, a world to create, and a plot to flesh out. Is it as action packed as the first book? No, but that doesn’t mean it’s not as good as the first and third books. Schwab weaves information and detail through the plot with trained fingers, providing me with a story that’s rich in detail and full in everything else. The third book was phenomenal. All the characters you hated in the second book are redeemed, and the concept of good and evil becomes a matter of perspective. (Except for the real bad guy. He’s evil no matter how you look at it). This book, on the other hand, starts off at a run and doesn’t rest until the last couple of chapters. I was like a drug addict, coming home from work every day I made a beeline for the book to feel the exhilarating high as the words seeped through my fingers and eyes and into my blood stream. This is the kind of young adult fiction I enjoy to read: fun, intriguing plot, compelling characters, and romance that doesn’t take a center stage position. It also doesn’t try and make me like all the main characters. In fact I think I disliked half of the characters that most people would like, including Lila most of the time. I’m not sure how I feel about the YA genre as a whole. There are a lot of bad books out there and a lot of them end up in the YA section of the bookstore, but V. E. Schwab has written several great books and has contributed some quality work with The Darker Shade of Magic trilogy. Her books did more than entertain: they challenged me to take a new look at the world and questioned the concept of good and evil. This entry was posted in Book Reviews, Fantasy, Fiction and tagged A Darker Shade of Magic, Book, fantasy, fiction, Magic, Review, V. E. Schwab. Bookmark the permalink.